Perfect for a relaxed summer soiree Daphne is Fun and flirty. This is for those not afraid to show a little skin and stand out from tradition. If this neckline is good enough for Megan Markle its good enough for us! 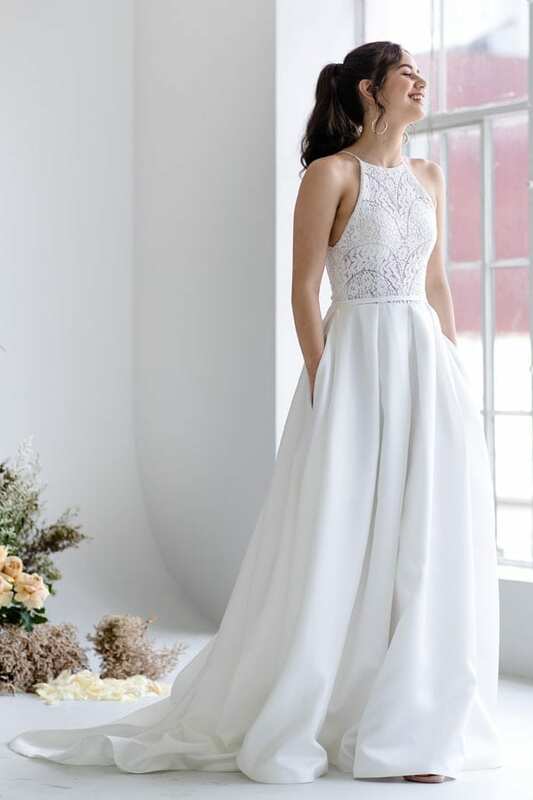 A gorgeous halter neck bodice covered in our fountain garden lace means this gown has a perfectly relaxed air. The stretch lace fits like a glove, flattering bare shoulders and nipping in at the waist for a beautiful flattering silhouette. Deep skirt pockets add fashion and fun perfect for the bride who doesn’t take herself too seriously. Make no mistake however, this is no ordinary gown, a box pleat full skirt and sweep train made from heavy luxe satin mean this gown has all the drama it needs. A true showstopper equally beautiful from front and back. Team your Daphne with an updo and statement earrings add in some colour if you dare and you’ll have the modern bridal look that will last the test of time.